In this post, I’ll be taking a look at the 6 formats available. For example, RayBiotech (distributed in Europe via tebu-bio) manufactures over 2 600 ISO certified and rigorously tested ELISA tests, all backed by a 100% guarantee. All RayBio® ELISAs are validated for exceptional reproducibility. Every kit is subjected to a battery of rigorous product-specific quality control tests and manufactured in compliance with GMP and ISO 13485 standards. 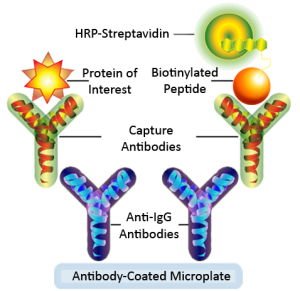 This matched antibody pair based format allows for the detection of cytokines, growth factors, soluble receptors and other soluble proteins. Samples such as plasma, serum, culture media, lysates or clarified body fluids are suitable. A wide variety of species are available such as human, rat, mouse but also cow, dog, horse, cat, sheep, pig, rabbit, rhesus macaque and cotton rat! 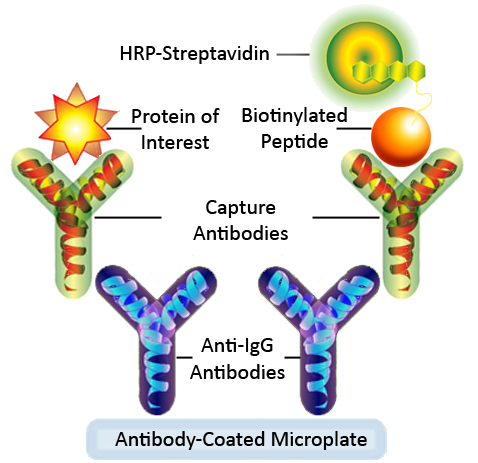 These sandwich ELISA kits are evaluated for intra-assay reproducibility by running 2-3 positive control samples in duplicate on a single plate (maximum tolerance = 10% CV). Inter-assay reproducibility is evaluated by at least 2 independent experiments with 2-3 positive control samples and a full standard curve (maximum tolerance = 12% CV). Lot-to-lot consistency is tested by comparing calculated concentrations of 2-3 positive control samples with calibration curves of current lot and previous lot (maximum tolerance = 20% CV). Recovery is determined by spiking various levels of target protein into biological samples. Dilution linearity is tested by performing 2-fold and 4-fold dilutions of biological samples. Recoveries typically range from 80-130% (maximum tolerance 70-150%). Tested biological sample types include serum, EDTA plasma, citrate plasma, heparin plasma (normal healthy donors) and cell culture medium (DMEM or 1640). 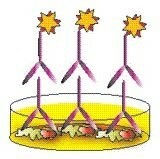 Recommended dilution ranges for serum and plasma are determined from this testing series. For lysate-specific sandwich ELISAs (catalog numbers ending in “-CL”), sample types include cell lysates and tissue homogenates of various origins. Access to our selection of Sandwich ELISA Kits here! Also sandwich based, these assays can detect phosphorylated targets such as MAPK, Akt, EGFR, Stat, mTOR and other signaling molecules. They are compatible with cell and tissue lysates for human, mouse and rat proteins. 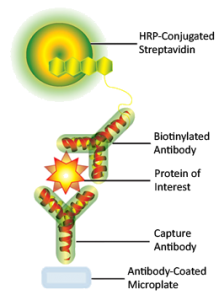 Access to our selection of Phosphorylation ELISA Kits here! 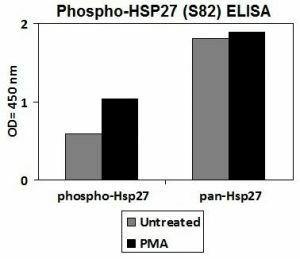 This assay is a direct format to allow detection of phosphorylated EGFRs, JNK, ERK, STATs, phosphotyrosine, and other signaling molecules on adherent cell lines. It is available for human, mouse and rat proteins. Access to our selection of Cell-based-phospho ELISA Kits here! This sandwich based ELISA has a compressed work flow and only requires 3 hours in total processing time. 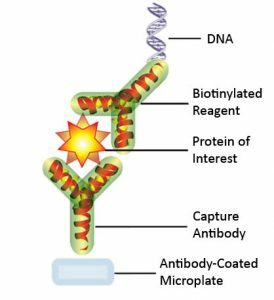 It is available for human, mouse and rat targets, from cytokines to growth factors and soluble proteins. Access to our selection of Speed ELISA Kits here! Access to our selection of EIA Kits here! This new ELISA format combines the specificity and ease of use of an ELISA with the high sensitivity of Real Time PCR. Now available for VEGF, IFN-Gamma, PDGF-BB and HGFR. 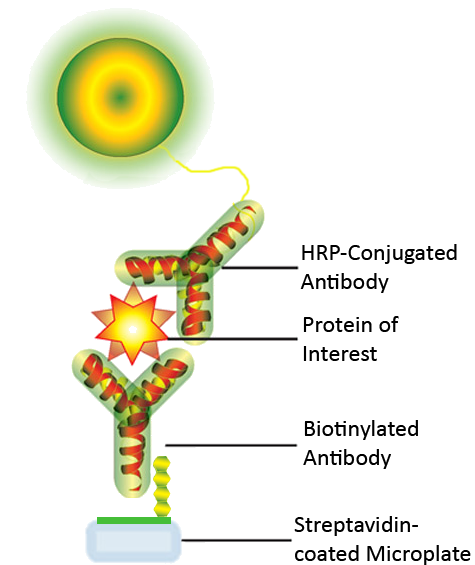 Why not outsourcing your ELISA tests to a Raybio’s Certified Service Provider like tebu-bio? If you’re not familiar with any of these formats, or need to externalise your assay to speed up your research, tebu-bio’s laboratories based near Paris can do the experiment for you. They will offer advice on sample preparation and storage, as well as sensitivity and range of the assay you select. A dedicated project manager will be your direct contact for optimal experimental design and regular reporting in full confidentiality. It’s cheaper than you think! Discover our lab services related to Biomarker validation, Protein profiling and quantification here! Looking for specific ELISA test? If this ELISA service is of interest to you, or if you need some advice in choosing the right assay for your project, just ask me your questions below, I’ll be pleased to help. Alternatively, you can use our easy to use ELISA test search engine, and select your target species, application and format.